Our sixth annual tournament was our best yet. 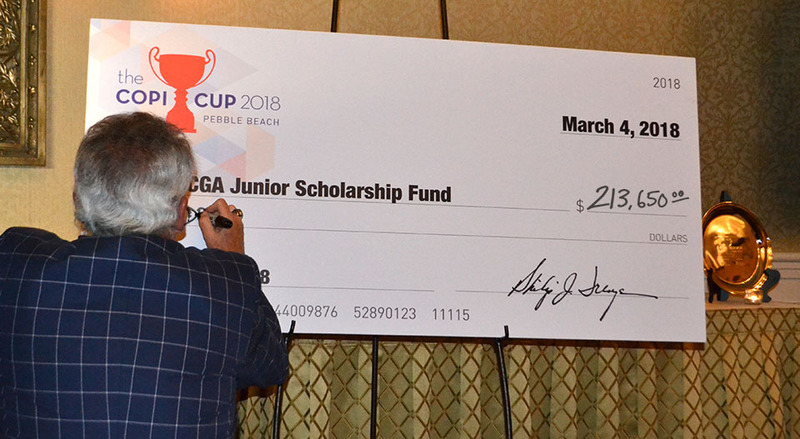 We had 21 teams competing, and we raised $213,650 for scholarships to help students through SCGA Junior! Our donors are phenomenally generous — and they have a great time participating in the COPi Cup as you can see. Congratulations to Ron Skayhan (PGA) and members Marc Myers, Buddy Pepp and Arnold Rosenstein from Hillcrest Country Club who won the 6th Annual COPi Cup. In the spirit of camaraderie and fun, we filled the cup with cold beer and celebrated together! Separately, John McMullen, Director of Golf at Hillcrest, took home the Low Professional Honors. See more photos from the 2018 Tournament here. Here are the full 2018 Tournament results. © Joann Dost. Reproduced by permission of Pebble Beach Company.